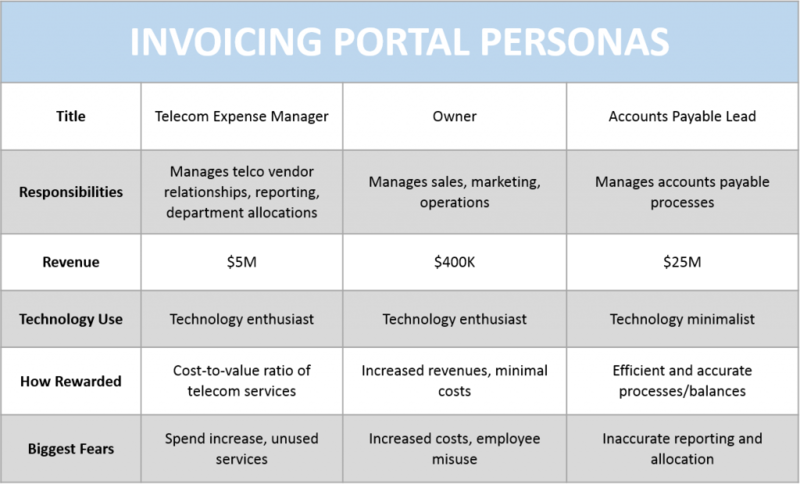 Companies don’t use your invoicing portal. People do. Yet many telecom and cloud service providers can fall into the trap of overlooking that point. Product managers and billing personnel can start to define “customer” segments based on company characteristics such as revenue or number of employees. But that segmentation can easily hide the stepping stone to a good customer experience which is a good user experience. When you start with users, suddenly the consideration of people’s roles and responsibilities come into focus. And your invoicing solution should make those responsibilities easier, more reliable, and more responsive. Knowing responsibilities is critical as it defines what functionality is relevant so you are solving a real problem. Knowing how a role is rewarded and what their biggest fears are lets you deliver a differentiated value proposition. The firmographic information can be used to evaluate differences in responsibilities, rewards, and fears across the various companies to allow the optimal packaging and pricing. People – not companies – are the users of your solution. Consequently, personas should be the core of your segmentation strategy. The benefit will be higher adoption, greater stickiness, and increased customer lifetime value.